Carbon Fiber Landing net. Weights 9oz. with rubber ghost net. Floats like a cork. Will make you a great net. 24" total lenght. Soft Yabbie Prawn Shrimp. Snag proof and helpful when landing and netting fish. Double Hook Shark Rig Stainless Steel 10/0. 17"x15" Rubber Landing Net Removable Handle. Long Shank Hook. 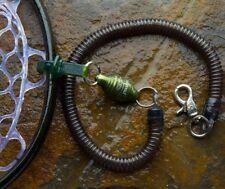 3 Sizes Mixed Long Shank Hook. The Clear Color Won't Spook Fish Because It Virtually Disappears Underwater. It's the best gift to send father, son, husband, fiancé, boyfriend. Great to use for wading, stream, shore or fly fishing, kayaking, boating and more. The basket is big enough to scoop it all. Fits Native Net. FitsHand Net ,Mid-Length Net ,Guide Net. The Nomad Boat Net sports an extra-long handle for extra-wily fish. Stringing Kit includes everything you need to restring a net. Antique Wooden ED CUMINGS TROUT FLY FISHING NET-- BEAUTIFUL!! Antique Wooden ED CUMINGS TROUT FLY FISHING NET-- BEAUTIFUL!! . Handle is a black rubber material and has "model B pat. pend" printed on one side, and "FLEX GRIP" printed on the other side. Condition is Used It was given to me by my grandfather. Shipped with USPS Priority Mail. EUC Wooden Trout Landing Fly Fishing Nylon Net Fishing. Condition is Used. Shipped with USPS Mail. Total length: 185cm / 6.07ft. Fishing landing net with retractable pole. 1 Fishing Landing Net. Opened length of pole: 145cm / 4.76ft. Aluminum alloy pole, lightweight and corrosion-resistant. Wonderful tool for fishing lover. If your net is worn out from landing too many fish we can help. Works with any Rising Brookie net. Gentle on fish. Easy to use. Condition is Used. It appears that a float with strap was added after the fact to this net. I took picture of the wear. There are no holes, or other major condition issues noted during inspection. Lightweight rubberized fishing net Tangle free net, snag free net Watertight fly box included. 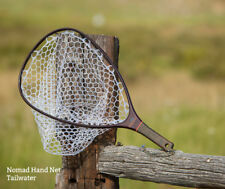 Fishpond Nomad Hand Net - Tailwater Edition. Check us out on the web, or in person at 1279 N Clybourn Ave, Chicago IL 60610. Nomad nets are made using a mixture of carbon fiber and fiber glass. The result is a very lightweight and durable net. Fighting with your landing net (or worse, losing it) is no fun. Carabiner attaches to back of vest, necklace or what-have-you. Can easily hold your net in the up or down position. Also works great with pliers. This is an economical version of our regular ghost net. We use plantation grown and non-native species woods to make this net. 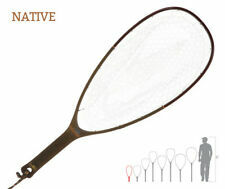 For all around stream fishing this net is an excellent choice and will accomodate fish to 20". V i n t a g e c o n d i t i o n.
Eco-clear net bag and Brodin net clip included. This is an economical version of our regular ghost net. We use plantation grown and non-native species woods to make this net. For general trout fishing this is the best all around net in a catch and release style. Netting won't rot or mildew. Lightweight and strong with a rubberized grip for easy handling. Our Catch and Release nets have a soft, clear rubber net which will protect delicate fish. Essential tool for Catch and Release areas. Nomad Nets are constructed with carbon fiber/fiberglass composite material. The result is a very lightweight and durable net. Nomad Nets are built for the conditions that prevail where great fishing exists; they are waterproof, UV protected, and float like a cork. ANGLERS ACCESSORIES CATCH & RELEASE NET W/RUBBER BAG. RUBBER BAG FOR EASY HOOK REMOVAL AND LESS STRESS ON FISH. NET BAG DEPTH: 9". This is a new catch and release net from Cortland that features a soft, clear net material that’s gentle on the fish and won’t tangle, rot or mildew. The clear net will not spook fish because it virtually disappears underwater. Short handle (extra large hoop) landing net. Net opening 20" x 15". Built with quality components, thick walled aluminum tubing with anodized bronzed finish. Extra depth soft woven knotless nylon net bag, holds fish securely while weighing. 10 x 4.75.". This fantastic net is hand signed by the maker "R. Leclair" Expect to never find another of these beautiful hand made nets of this quality! 30.00 price reduction taken just in timr for Christmas. 33' overall with a 12" by 18" opening. Helpful Links. Net appears to be in good shape. Minor wear. This net has a generous size opening but is still easy to carry. This is an economical version of our regular ghost net. We use plantation grown and non-native species woods to make this net. 12.75" by 18" hoop. Long handle (Large hoop) landing net. Net opening 17" x 12". Non-slip handle and bungy cord for shoulder carry. Built with quality components, thick walled aluminum tubing with anodized bronzed finish. The perfect accessory to keep your Nomad Net close and always at the ready. Each fishpond design is inspired by our own angling experiences and travel adventures-resulting in products that perform flawlessly under the most demanding conditions. A nice new and never used fly fishing net from North Country Anglers, fly fishing outfitters in North Conway, NH. Model number or serial no. The net is jet black. In amazing condition with a brass clip as seen in the photos. Super nice condition! The brass clip is from England.